Calendula is one of the most popularly grown edible flowers. Although Calendula is commonly called "Pot Marigold", they are not in the same genus as the common marigold, Tagetes. However, they are part of the same family, Asteraceae, along with daisies and chrysanthemums. You can see the resemblance in their daisy-like flowers. They got the name Pot Marigold because of their gold flowers that bloomed during the festivals celebrating the Virgin Mary (marigold) and their use in cooking, or pots. Many gardeners simply grow pot marigolds for their cheery bright flowers and profuse blooming. They are most commonly thought of as having yellow and orange flowers, but there are more subtle pink and cream varieties. Pot marigolds will bloom throughout the growing season. The leaves are slightly fussy and not the most attractive part of the plants. Although the petals have a slightly bitter flavor, they have no fragrance. They’re used in all kinds of recipes, from butter to wine, but they are most favored for their intense color. 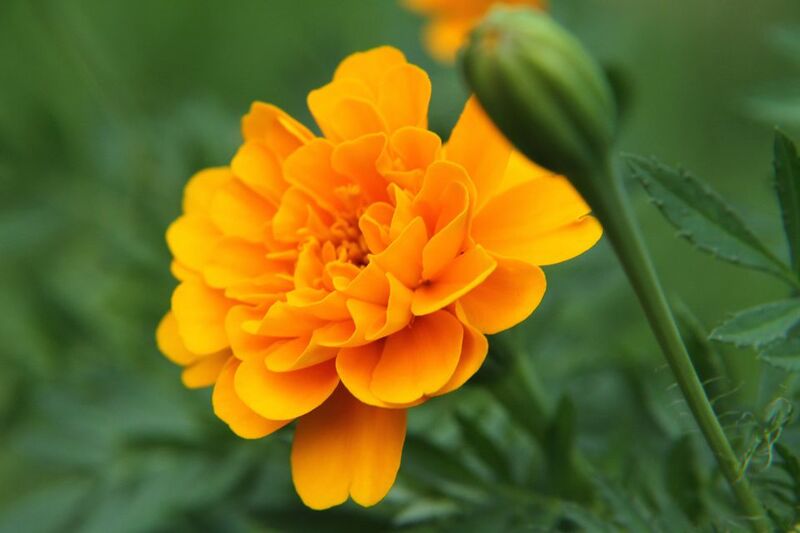 Pot marigolds are short-lived perennials in USDA hardiness zones 9 and higher. They are commonly grown as annuals. All types of calendula will bloom best if grown in full sun to partial shade. They will need regular water, if grown in full sun, in hot, dry climates. Most varieties of pot marigolds will grow about 8 - 18 inches (h) x 2 - 4inches (w). The size will also depend on how much you cut and use them. Cutting the flower stems will encourage the plant to branch out and produce more flowers. Most plants begin blooming within 2 months of seeding. They will repeat bloom throughout the summer, especially if you keep them deadheaded. So don't be afraid to harvest and use your pot marigold flowers. Collect calendula flowers in the late morning, after the dew has dried. Pick flowers when they are fully open and check often because they come and go quickly. You can use the flowers fresh or you can dry and store the blossoms for later use. Cut the flower heads off and spread them out on a screen, in a shady, dry spot. Turn them occasionally until they are papery dry and store in canning jars until ready to use. Pot marigolds make nice edging plants and grow well in containers. If you’d like to use your calendula blossoms in cooking, be sure to grow them organically. This is easy to do if you grow them in the vegetable garden, but you should also keep that in mind if they are planted in flower border or pots. Calendula officinalis "Pacific Beauty Mixed Colors": This is a more heat tolerant variety of the traditional yellow and orange plants. Calendula officinalis "Sherbet Fizz": Soft blush tones with darker red undersides. Calendula officinalis "Resina Calendula": High resin content makes it popular for oils and tinctures. Pot marigolds can be direct seeded in the spring or even summer, or they can be started indoors as transplants. They’re very easy maintenance and once established in your garden, they will self-seed, but they don’t generally become a nuisance. Rich soil and a full sun location will keep your calendula blooming, although they will adapt to most any soil conditions. Pot marigolds will slow down in extreme heat and warmer climates (zones 8 and up) will have more success growing them as fall or early spring flowers. In more temperate areas, watering regularly will help keep them going in the peak of summer and your pot marigold will bloom until frost. Don’t be afraid to cut blooms from your pot marigold. It will only encourage more budding, which is a good thing. In addition to their culinary uses, pot marigolds are used in herbal medicine, as a dye plant and even as a cut flower. These plants are virtually problem free. They are more likely to suffer drought stress than to be affected by disease.